Lead-safety Message: Lead is a cumulative toxicant that affects multiple body systems and is particularly harmful to young children. • Lead in the body is distributed to the brain, liver, kidney and bones. It is stored in the teeth and bones, where it accumulates over time. Lead in bone is released into blood during pregnancy and becomes a source of exposure to the developing fetus. • There is no known level of lead exposure that is considered safe. • Lead exposure is preventable. 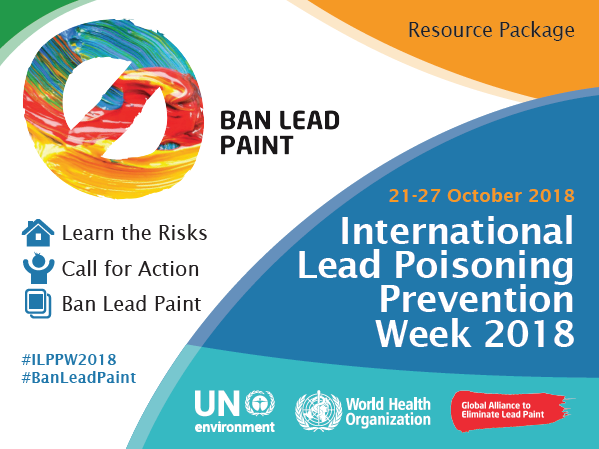 From 21 to 27 October 2018 the international lead poisoning prevention week of action will take place, with a particular focus on eliminating lead paint. Lead poisoning is preventable, yet the Institute for Health Metrics and Evaluation has estimated that, based on 2016 data, lead exposure accounted for 540 000 deaths and 13.9 million years lost to disability and death due to long-term effects on health, with the highest burden in developing regions. Of particular concern is the role of lead exposure in the development of intellectual disability in children. Even though there is wide recognition of this problem and many countries have taken action, exposure to lead, particularly in childhood, remains of key concern to health care providers and public health officials worldwide. Never mix soil samples from different places in a yard.